It has been a busy week. Lot's of parties, which doesn't seem normal for a blustery week in late February. Before I go into detail, though, let's start with the news: A new pastry chef is starting at Aquavit on Monday. Candice Chia, formerly pastry sous chef at Café Boulud, will be executive pastry chef there. And Marcus Jernmark, who last time we heard, was running the kitchen, but hadn’t been promoted yet, is now executive chef. That’s all according to Aquavit owner Håken Swahn (Marcus Samuelsson’s business partner). He’s the gentleman in the picture at the beginning of his blog entry, standing next to Rita Jammet, a former restaurateur and very proud mother of Nicolas Jammet, partner in the burgeoning Sweetgreen salad and frozen yogurt chain. I learned all of that on Wednesday at the annual C-CAP benefit. But the week started, as weeks do, on Monday, when D’Artagnan, supplier of foie gras and other goodies, threw a big party at Guastavino to celebrate its 25th anniversary. I invited my friend Blain Howard, the ultimate combination of video game geek and cool guy. It was interesting to watch him as he talked about video games with Autumn, a friend of Will Blunt of Starchefs. She asked him what his favorite video game was, and he said Super Mario Bros. 3, and then went into details as to why, and how that was his favorite of old-school games but his favorite new game was Bioshock, which is apparently a really scary one. And then he really geeked out on all the details and I lost track. It’s fascinating to see someone who once worked at Abercrombe & Fitch as one of those models/salespeople talk like that. Such poise and confidence while also being so phenomenally dorky. It’s charming. So we ate ribs and foie gras and cassoulet while drinking wine from Southwestern France and sharing opinions about Caprica. On Tuesday I went to the launch of Burger King's new batch broiler during lunch and then stayed at work late to finish writing about sourcing obscure ingredients — a story you'll get to enjoy a couple of weeks from now. Wednesday, as you know, was the always awesome C-CAP fundraiser, which you can read about here (complete with slide show). The second picture in this blog entry is of John Fraser, executive chef of Dovetail, and Gramercy Tavern pastry chef Nancy Olson. John gave me the scoop on a big, exciting change underway at Dovetail and then asked me not to tell anyone. So I won’t tell anyone, but be on the look-out for an excellent announcement from John in early March. Second Monday of the month maybe. Last night was a really fun party at the Astor Center celebrating the 10th anniversary of Gastronomica, where the irrepressible Dave Arnold, director of culinary technology at the International Culinary Center aka The French Culinary Institute, was making cocktails out of local rye whiskey, and also serving up amazing little passion fruit puffs, made by adding a little bit of one of those methylcellulose compounds to passion fruit purée, puffing them up and then freezing them in liquid nitrogen. Dave said this was an old trick, possibly developed by Sean Brock, but he wasn’t sure, after the gang in molecular gastronomy world realized that things that didn't contain much moisture were easily eaten even right after they'd been frozen with liquid nitrogen. So he poured liquid nitrogen over the little passion fruit puffs, popped one in his mouth and then blew what looked like smoke out of his nose. Like a dragon. Of course it was vapor from the liquid nitrogen, but it was awesome. Pavia Rosati ate her passion fruit puff seductively and elegantly, blowing vapor out of her mouth like she'd just smoked a cigarette and then French-inhaling it again up her nose. She’s marvelous, that Pavia. She really is. I spoke with James Beard Foundation president Susan Ungaro this afternoon about the fact that so many of the 397 semi-finalists for this year’s chef and restaurant awards are newcomers to the list. As I mentioned when I reported on the semi-finalists last week, more than half (the actual figure is 53 percent) were on the list last year, too. But considering how many of the same nominees return year after year, that’s pretty good turnover. Susan explained that the nomination process has been democratized. Although just about 400 people — past winners and the media — judge the awards, anyone can nominate a chef. That’s been true since 2008, when the awards went all-electronic. That year more than 9,000 people submitted nominations in the 17 chef and restaurant categories. Last year 15,000 people participated in the process, and this year it was more than 21,000. Then in most categories the awards committee picks the top 20 names, and those are the semifinalists. An exception is the Rising Star award, which goes to chefs age 30 and younger, so they have a limited window in which to win it. The awards committee takes that into consideration and lets a few more names slip on. The result is the ungainly-looking list of 26 names you see meandering down the upper right-hand side of this page. Susan told me one of her goals as president was to try to alleviate the foundation's reputation as an elitist group focused on the East and West Coasts (I'd accuse it more of being New York-centric, actually), and to extend a hand to the masses. Well, if you look at that list, only one nominee is from New York, but that was true last year (it was Ryan Skeen from Irving Mill, in case you were wondering). This year’s list has more chefs from cities in the interior* — Milwaukee, Pittsburgh, Des Moines, Denver, Cleveland, Minneapolis and Peoria Heights, Ill. There's also a nominee from Hawaii’s smallest major island, Kaua‘i, Colin Hazama from the St. Regis hotel there. I guess that’s off the beaten path in the grand scheme of things. But he was also a nominee last year. So was Sameh Wadi from Minneapolis. The rest weren’t on last year’s list and the only other interior cities that were represented were Farmington, Pa., Rochester, Minn., and Memphis, Tenn. Okay, so this year’s list isn’t that much more geographically diverse than last year's. It’s still dominated by coastal cities, but then again, coastal cities are most of the country's major population centers. I do wonder why Chicago’s not represented, though. Maybe too many great young chefs split the local vote. *for these purposes I’m going to classify Philadelphia and its suburbs as East Coast, even though it’s technically not, because it is culturally, and the rest of Pennsylvania as interior; and Las Vegas as West Coast; New Orleans is unclassifiable, but since it has always been considered an important food city I'm going to say it's not interior, but I'll go ahead and say Houston is interior. That’s just how I roll. Chicago is always well represented in the awards, although it doesn’t have any rising star nominees this year, unless you count Peoria as a suburb, and I think that’s stretching it a bit. 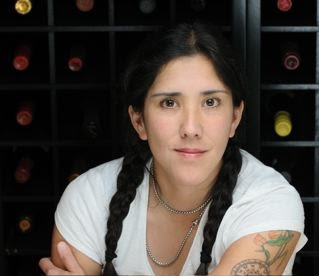 The last time, I mentioned Celina Tio, she was planning on opening a restaurant called Julia(n) in Charlotte, N.C.
Well, plans for that fell through awhile back — something to do with a disagreement with the landlord, if memory serves — and it turns out that she’s back in Kansas City and is the proud chef and owner of Julian (sans parenthesis — as a general rule, it’s a good idea when you’re thinking of putting parentheses in your restaurant’s name to think again). Celina’s billing the food as refined but comforting food made with local, seasonal ingredients, which is to say that she’s doing what most other fine-dining chefs in the country are doing. I don’t mean that in a bad way, in fact, I mean that in a good way. It makes sense to respond to the Zeitgeist, after all, doesn’t it? The full menu’s on the restaurant’s web site, but it includes things like lobster shepherds pie, cassoulet, short ribs with gratin potatoes and Brussels sprouts, a cheeseburger — you get the idea. There are also "popcorn sweetbreads" for appetizers, and a lobster salad with grapefruit, fennel and argan oil. Who knew argan oil would get so popular? Emilia-Romagna and Sicily tied in this blog's latest poll, which asked readers to pick their favorite Italian region for food. You can read the full results at nrn.com. I’m going to sleep soon, but first, in case you really need to know who won the Bocuse d'Or USA competition and don’t follow me on Twitter but can’t wait until it’s up on the Nation's Restaurant News web site later this morning, I’ll go ahead and tell you it's James Kent from Eleven Madison Park. 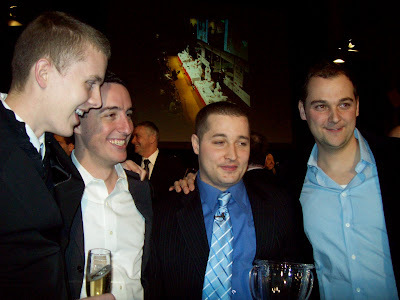 I saved the good pictures for NRN.com, because I know where my bread is buttered, but this is an outtake, of (from the right), Eleven Madison Park executive chef Daniel Humm, Bocuse d’Or USA champion and today’s king of the world James Kent, EMP general manager Will Guidara (or as people in the chain restaurant biz say, “Frank's boy”) and Tom Allan, who like James Kent is one of EMP’s sous chefs, but James played captain in this competition, so he's the winner. Tom will accompany him to Lyon in January of next year to represent the stars and stripes there. Tonight, everyone in this picture is probably getting drunk. Maialino is probably the hottest Roman restaurant in New York City right now. It can’t help it; it’s a Danny Meyer restaurant and New Yorkers love Danny Meyer. But there’s a lot of Roman food out there. Lupa’s full name is Lupa Osteria Romana. Sandro Fioriti, currently of Sandro’s on the Upper East Side, has been dishing up carciofi alla giudia and any number of carbonara and amatriciana dishes for the better part of 25 years, and, well, Florence Fabricant recently gave a rundown of Roman restaurants in the Times. That makes Roman the trendiest Italian regional cuisine in New York at the moment, but there’s a poll on the right side of this screen asking you what your favorite Italian region is for food. Go ahead — pick one. (Rome’s in Lazio, by the way). Not too long ago I had lunch at one of New York's newer Roman places, Sora Lella. Sora’s slang for Signora, or madam, and Lella was the nickname for Elena Trabalza, the original chef of the original restaurant, on Isola Tiberina, a little island in the Tiber River in Rome. I went to the New York branch with the restaurant's publicist, which is a good thing, because the restaurant was closed for lunch that day and its owners don’t speak a whole lot of English, except for the chef, Fabio, who, you know, had to be in the kitchen making lunch. I understand a fair number of Italian food words, but not much else. Sora Lella’s owners are a nice group, all family members, who said they decided to finally open in New York after visitors from Gotham to their restaurant in Rome had been bugging them to do so for years. They opened their doors in far western SoHo (Spring St., between Hudson and Renwich streets) about nine months ago. Their business partner, who owns the building, told me about how many new residences and businesses were being established in the area, something I'd been hearing about the neighborhood since Dani opened four years ago two blocks away from where Sora Lella is now. Dani failed to thrive and closed a scant two years after it opened, but a bunch of restaurants have opened around there since then, like 508 — at 508 Greenwich St., a block and a half away. The owners of both Sora Lella and 508 say they’re doing well and enjoy good followings from local denizens, including the celebrities who live not too far away. When I had dinner at 508 recently, Thom Filicia, the interior design guy from Queer Eye for the Straight Guy, was at the bar, so that’s something. Nonna means grandmother, and polpettine are actually meatballs. But I guess "sliders” are slightly more trendy than meatballs — although maybe not, according to my friend Andrew Knowlton who I just saw on TV a little while ago declaring meatballs the food of 2010. I’m afraid I don’t know what show he said that on, because I don’t watch morning TV programs that invite people like Andrew to talk about food, but a tiny clip of it was replayed either on The Daily Show or The Colbert Report, and I saw it there. Back at Sora Lella, I also had classic gnocchi all'Amatriciana and braised oxtail with pine nuts, among other things. The Trabalzas have embraced their restaurant’s new American location, and even are offering a Super Bowl menu this Sunday. Beef “sliders”, Breaded, Deep Fried and Topped with Tomato Sauce. 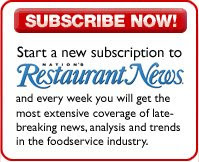 Nation’s Restaurant News, the magazine of which this blog is part, is intended for, and mostly read by, people who own or manage restaurants or are in some way involved in buying or selling things for restaurants. A lot of food writers read it, too, and many of your favorite consumer magazines and newspapers subscribe and copy liberally from it. Some NRN readers also read this blog, but a lot of people who read this don’t read NRN (and, as the lackluster number of responses to my poll on MUFSO illustrate, they're not interested in big chain restaurant conventions). They are simply food enthusiasts or restaurant scene voyeurs and the sort of people who might be interested in the casting call announcement I just received, which I will paste below, exclamation marks and all. Restaurant operators and former operators are not invited. Food Network and the producers of The Next Food Network Star are looking for two person teams for a new competition series! Two person teams with pre-existing relationships: Husband & wife, ex-husband & wife, father & daughter, mother & son, newlyweds, brothers, sisters, twins, cousins, best friends, etc. The Skills to Run a Restaurant: Applicants may have no restaurant experience, a ton of experience, or some combination of the two. One member of the team will be the chef and run the kitchen, and the other will run the “front of the house,” so all we ask is that you have the skills to, as a team, actually run a restaurant. *Please don’t apply if you already own your own restaurant or have previously owned a restaurant. • Applicants must (a) be a US citizen or permanent legal resident with the unrestricted ability to work in the U.S. and (b) be at least 18 years of age.